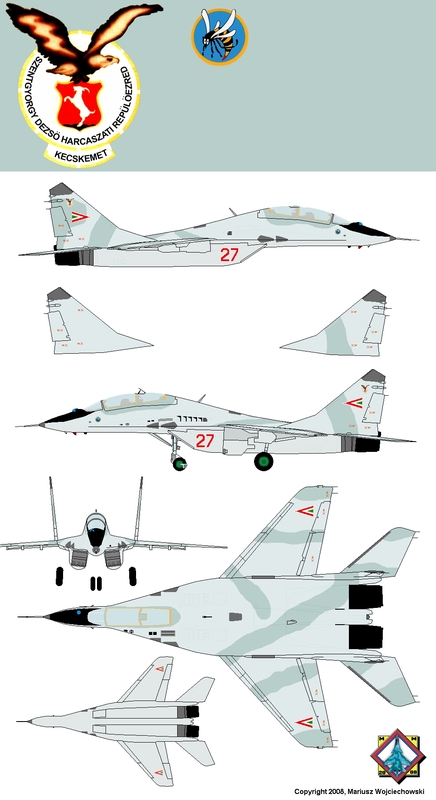 Hungary was the only one socialist country in Europe NOT HAVING MiGs in time of Warsaw Pact. Obtain MiGs in 1993 from Russia, as payment for Soviet and Russian debts (version 9-12B, not 9-12A). 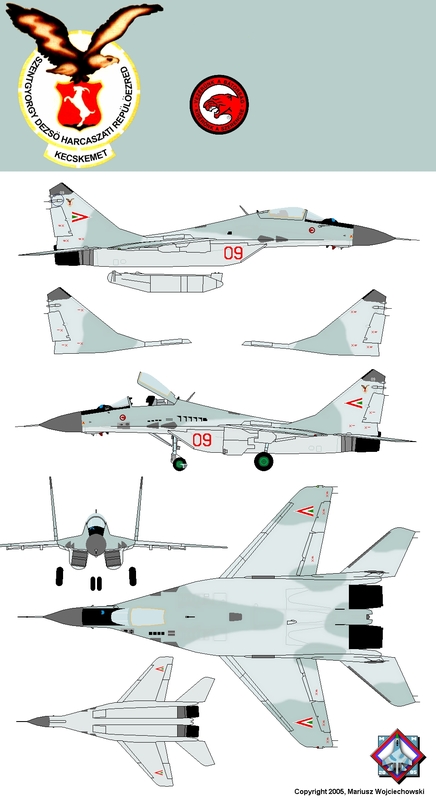 Since 2003 MiGs were overhauled and repainted in low-visibility scheme (black numbers, even a false canopies). 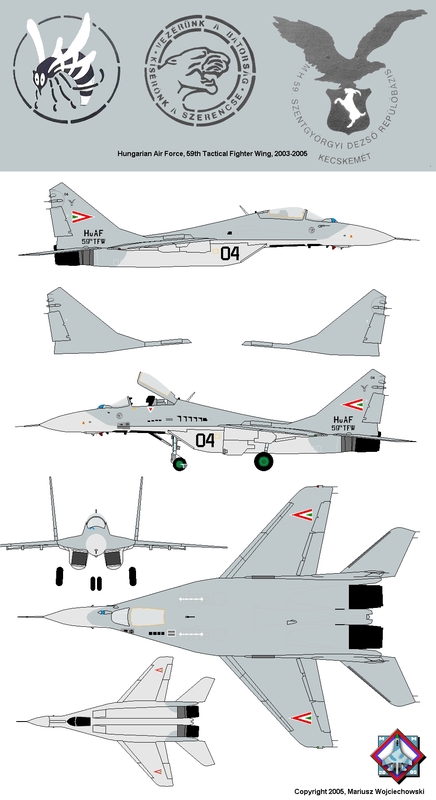 New painting scheme (similar to JAS-39 Gripen) it's a final result of the test on MiG-29 no. 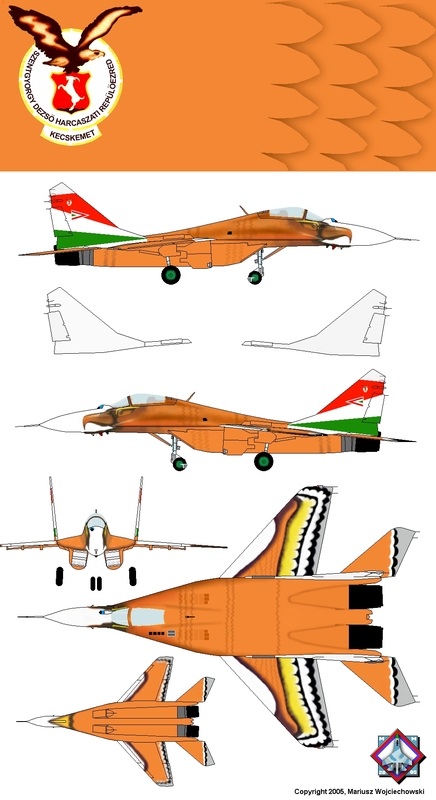 04, on which various configuration were checked: red or black numbers on air intakes, lightgrey (or even white) or black descriptions on fins, blue or black false canopy underside, grey or colourful national marks (even in the same time aircraft has grey marking on right side and colourful on left side). Eight aircraft were offered to sell in 2010 and in 2013. In the end of year 2017 all of decommissioned MiGs (23 aircraft) were offered to sell with 20 engines, rockets and over 1.2 thousand spare parts. Some of them for years remainded under open sky at the Kecskemet air base. From #01 to #29 without #13, in two regiment's squadrons: Puma Repülöszazad [Cougars] and Dongo Repülöszazad [Bees]. MiG-29 #22, Hungary 1998, 60th anniversary of the Hungarian Air Force 1938-1998. MiG-29 #23, Hungary 2000, The Eagle. MiG-29 #04, Hungary, 59th Tactical Fighter Wing, Kecskemet 2005. 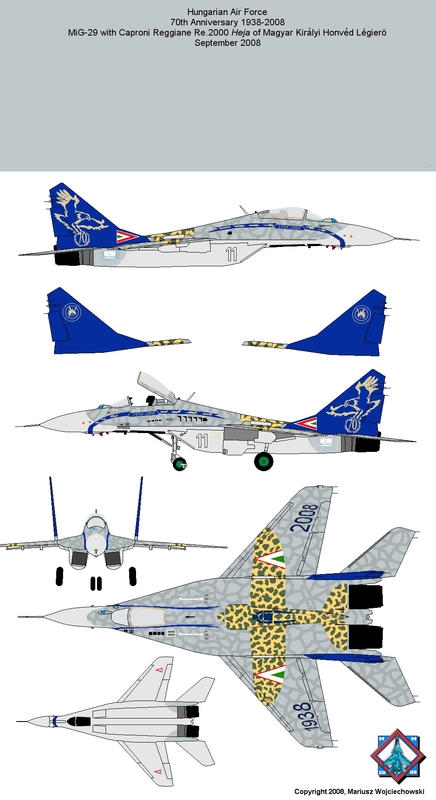 MiG-29 #11, Hungary, 59th Tactical Fighter Wing, September 2008. 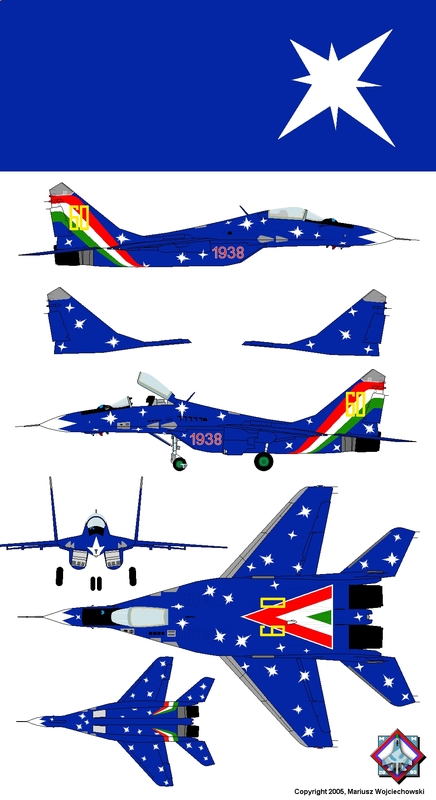 70th anniversary of the Hungarian Air Force 1938-2008. MiG-29 with 14 helicopters and aircraft on bands (incl. Mi-1, Mi-2, Mi-8, Mi-24, MiG-15, MiG-21, MiG-29, JAS-39 Gripen); '1938 Caproni Reggiane Re.2000 "Heja" of the Magyar Kiralyi Honved Legiero.